Round 1 of the wind will move in during the overnight and is expect to stick around through Labor Day afternoon. We may see a lull in tropical storm force wind gusts Monday evening/night, but then as Hermine lifts out of our area, winds will gust again to 40 mph Tuesday. Rainfall will be locally heavy — expecting 1-2” of rain for the Cape and Islands, dropping off to under an inch in Boston and almost nothing North of Massachusetts. Tide, thankfully are running low — but we could still see some more flooding in some of the back bays Monday and Tuesday. 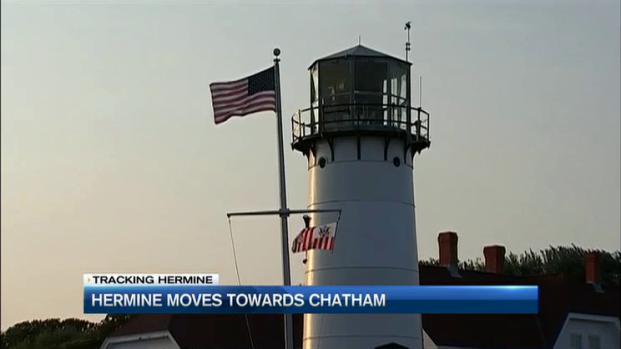 Residents and tourists in Chatham, Massachusetts, are taking the threat of Hermine all in stride and waiting to see what the storm will bring. Hermine will move out of the area Tuesday night and sunshine will return by Wednesday.